LED Filament Flame Tip Candle Lamp 4W SBC (B15d) 450lm (2 Pack) is rated 4.6 out of 5 by 13. Rated 5 out of 5 by Martyn79 from Great light output Led filament bulbs have come a long way recently and these are now a viable replacement for eco halogen bulbs, these 4w bulbs give out bright light and and pound for pound will easily outlast the halogen equivalent. Rated 2 out of 5 by Nigel777 from Do not all last as stated Bought 10 had two fail so far with very little usage . Rated 5 out of 5 by Jackthegripper from I've seen the light These lamps look good when switched off and give an excellent warm white light when in use. Brighter than I expected for the wattage. Can't yet comment on longevity. Rated 5 out of 5 by StuK from Perform well and look good I have three 5-arm chandeliers in my home which all take E14 (SES) bulbs. They used to use halogen candle shaped bulbs but as they blow, I'm converting them to these LED filament types. The light output is great and with a relatively small 4W input per bulb. Individually the illumination from one bulb would only be useful for a lamp or ambient lighting, but paired up together with more (like the 5 in my light) the total illumination is crisp and bright. Even though they are 'warm' white, I find the output pleasingly bright and not noticably yellow. The 'flame effect' tip is not strictly necessary but for the extra 50p per bulb over their plain countetparts (also sold here), I think it is worth it for a bit of cosmetic design. Rated 5 out of 5 by Oldpidge from Bedside lights I bought these because we have some old fashioned porcelain and gilt wall lights around our bed for reading on a night. The previous opaque leds looked odd in the fittings. Their predecessors were tungsten and swallowed wattage. These cast a good warm, not harsh light allowing the mk1 eyeballs to get a steady read. 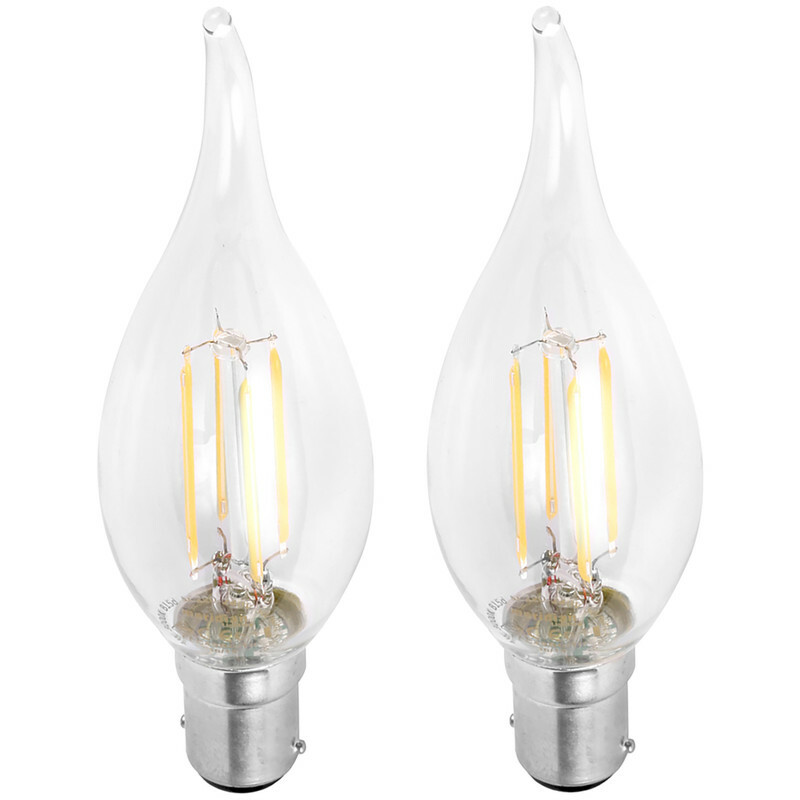 They look nice and I guesstimate they each cast a light comparable with about a 40 watt old tungsten filament bulb. They are instant as well, unlike the old cfl bulbs. Rated 5 out of 5 by Emmy from Ultra Bright. Very pleased so far with the candle bulbs. They are bright instantly and very cheap to run. Their claimed life expectancy is impressive but only experience will tell if performance matches the hype. Rated 3 out of 5 by Furnace 73 from Looks fine Unfortunately I am in the process of making alterations and there has been no time to evaluate the product. However as it is a LED unit I am sure that there will be problem.